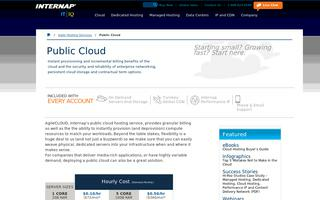 AgileCLOUD, Internap’s public cloud hosting service, provides granular billing as well as the the ability to instantly provision (and deprovision) compute resources to match your workloads. Beyond the table stakes, flexibility is a huge deal to us (and not just a buzzword) so we make sure that you can easily weave physical, dedicated servers into your infrastructure when and where it makes sense. For companies that deliver media-rich applications, or have highly variable demand, deploying a public cloud can also be a great solution.